Are you a baby boomer singleton wondering where and how to meet other eligible singles who weren’t born yesterday? Why not try your doctor’s waiting room? Let’s face it—we’re spending more time dealing with health issues as we get older, so why not put that time to good use by fishing where the fish are, so to speak? Plus, having a malady in common could be a bonding experience from the get-go. Think about it. For starters, you’ll have a healthy (as in considerable) pool of potential mates/dates to choose from. According to the CDC, Americans over age 18 made 928.6 million visits to physicians’ offices in 2012 (the most recent year for which statistics are available). There were 300.8 visits per 100 people (that’s 3/person/year), and 54.6% of visits were made to primary care physicians. The most frequent illness-related reason for their visit? Cough (so bring hand sanitizer and antibacterial wipes). The most commonly diagnosed condition? Joint disease (like arthritis) and related disorders—the risk for which increases with age. But look on the bright side: wonky older knees and hips make it harder for someone to run away from you. What’s more, the ranks of Medicare enrollees are growing by an estimated 10,000 a day—that’s how many U.S. baby boomers are turning 65 daily, ensuring a steady stream of fresh, age-appropriate prospects with health insurance (for now, anyway). If you sit within earshot of the receptionist, you may be able to glean some vital data about your prospect during check-in, such as name, date of birth, address, phone number, email, etc. The nurse or medical assistant may also announce your prospect’s name when it’s their turn to see the doctor. If you’re at an internist/GP’s office and your prospect is sick (versus there for a wellness visit), you’re probably seeing them at their worst. If you still see potential, just slather yourself with hand sanitizer before and after contact. For optimal screening of the greatest number of candidates, arrive early for your own appointment. And there’s this: for once, it’s an advantage if the doctor runs late, giving you more time to get to know someone. 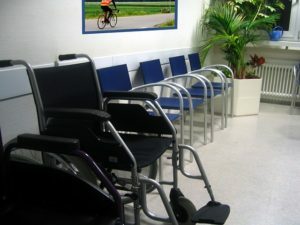 The waiting room for screening procedures such as colonoscopy. This works well if you’re the designated driver (DD) for someone undergoing a colonoscopy. It gives you an extended period during which to converse with a prospect’s DD and determine their relationship with the patient. If you’re undergoing the procedure, you may be able to get to know a prospect at the other end, so to speak (in the recovery room, that is), which can foster an immediate sense of camaraderie—if not intimacy—since you’re both likely farting your brains out. And what better way to get past the awkwardness of tooting in each other’s presence for the first time than to be in a setting where you’re encouraged to let ‘er rip? Outpatient surgery center. Here people are likely undergoing joint replacements or other minimally invasive procedures, and you can get a sense of someone’s activity level, pain tolerance, and the health problem(s) that brought them here. Physical therapy. The fact someone is undergoing PT suggests a certain level of motivation to improve strength and mobility, which can bode well if you’re ISO a fit and active companion. In line at the pharmacy. This may reveal what drugs a prospect is taking to address a particular health issue. Granted, it only provides a snapshot since they may have other prescriptions not being filled that day, but it could be pertinent nonetheless (if a guy is picking up an ED drug, for instance). Urgent care center. Again, you may be seeing someone at their worst, but if you still find them appealing, chances are you’ll have plenty of time to talk, since waiting times can be onerous. Medicare enrollment seminars. Assuming, of course, that we still have Medicare when the GOP gets done with it. Finally, there’s what you might call the post-medical venue: funerals and wakes. Decorum dictates that you not hit on the bereaved spouse, but there may be others in attendance with whom you can make a love connection. People at these events are often gripped by the sense that life is fleeting, so they may be more open to carpe diem when it comes to romance. Plus, black is slimming. All that said, it really behooves us to do all we can to stay out of the doctor’s office: exercise, eat right, get enough sleep, reduce stress and hydrate. It’s bound to make you a more appealing potential date/mate, if that’s what you’re after—and capable of hanging out in places that are way more fun. I think you may be on to something at this funeral thing. I call my elderly mom’s friend ‘funeral hags’not because they’re old, but because they NEVER miss a funeral, even if they don’t know the deceased. NOW, I’m onto them, they’re putting on their slimming black dresses and fancy jewelry to snag a date!!! HAHAHA. Oh, just wait til I see those gals. I suppose at a certain age, funerals do become all-too-frequent social gatherings–and an opportunity to see who’s single. Who’d a thunk it? OMG! There should be speed dating at the doctor’s offices. Cut them in and they might serve wine and cheese! Now there’s a entrepreneurial business opportunity if I ever heard one!